I'm back with another Wreck This Journal installment today and, as ever, my recent pages contain a lot of colour. I found myself experiencing a little bit of a creative slump journal-wise but I eventually picked up where I left off and had a really good time doing so. I'd love to know what you would've done with the pages so let me know below and I'll steal all of your ideas for future journals, ha! I shared the beginnings of this page in my May Wreck This Journal post but I finally got round to finishing it this month. It took me five sheets of stickers and three months but I got there. Well done me! I'm pretty happy with how this page looks. It covers a few of my favourite topics: cats, space, fast food and cake. It's glorious. Luckily enough, I was gifted lots of washi tape for my birthday last month so I was able to go to town on this page. I approached this page with no idea of what I wanted to do and I think it shows. In hindsight, it probably would've been nice to have a little plan in mind but I'm happy enough with the mishmash of colours, patterns and shapes. I might tape the opposite page too. We'll see! I decided to use my new pens to jazz this page up a bit. It's sort of ridiculous how long this took me but it was totally therapeutic. It wasn't difficult and it's not very inspiring but I just went with it. I just need to finish off writing page numbers throughout. I love these pages! I love Adventure Time so there seemed like only one viable option for this page, to be honest. I did toy with the idea of actually freezing the page but I thought an AT reference would be a lot more me. Big thanks to Luke for helping me out with the Ice King! P.s check out my other wreck this journal posts for more inspo! this post contains an affiliate link - if you buy a wreck this journal with the link i've provided, i'll receive a tiny commission to put towards books in the future. to all those who have used my link, thank you. you're good eggs. I love what you did with literally every page of this Wreck this Journal. It's funny to see how differently people interpret the instructions! Five sheets of stickers... That's a lot of stickers, but totally worth it! Unfortunately (wow, that's a lot of adverbs), I'm not a UK resident so I can't participate in the giveaway... But it doesn't prevent me from thanking you for organising it :). 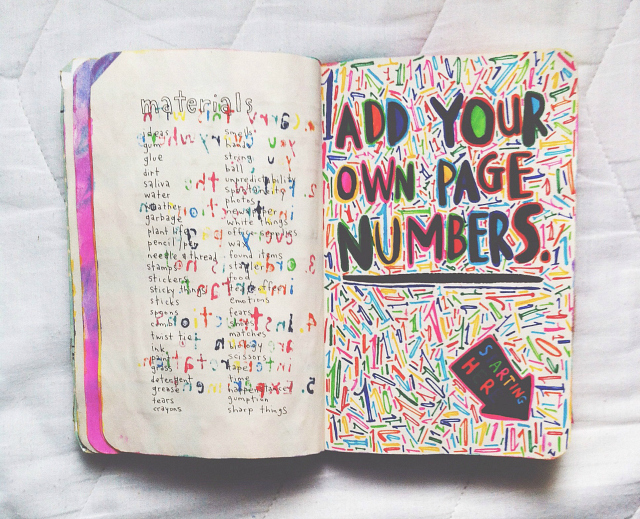 I really love how your 'Add your own page numbers' page came out, so cool and such a beautiful idea! Everytime I read one of these posts from you I always feel the need to go back to my Wreck This Journal and give it some love again (which I never do and it's such a shame!). Loving your journal- looks super cool! I quite like the idea of something that inspires a bit of creativity as I'm about as creative as your average brick wall. I've found that taking a break from everything just lately has been the biggest help for creating blog posts and feeling engaged with the internet- since that's the only creative pursuit I have. Sometimes, it's beneficial to take a step back from the process to understand how to find fresh perspective. 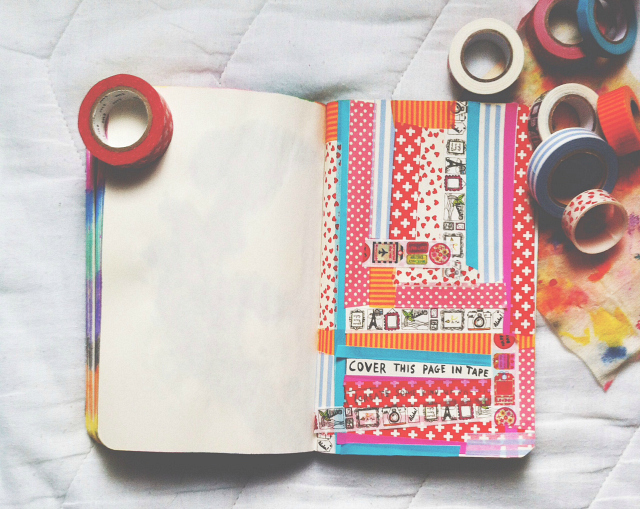 Love these posts Bee, I've had a Wreck my Journal for so long! I found it when I moved so I'm definitely going to start getting creative again! You've inspired me to use my WTJ more, I lost it but I've finally found it again! I'd love to see some photography posts! Tumblr inspires me. i really enjoy seeing your journal's progress Bee! Ummmm amazing giveaway! If I don't win (plz can I win tho?) I'm definitely going to get these journals for myself! 2. Follow your heart, always. 3. Friends, blogs, music & emotiooonnnssss inspire me. Reading your posts about Wreck it Journal has seriously made me want one! I love the way you are decorating and using it - Loved the AT reference. Perhaps a homewear or bedroom haul? I dunno - or even a stationary haul? Experiment with different things which you haven't used before e.g. chalk, dye, blow pens? Nature inspires me to be creative, that and art galleries. 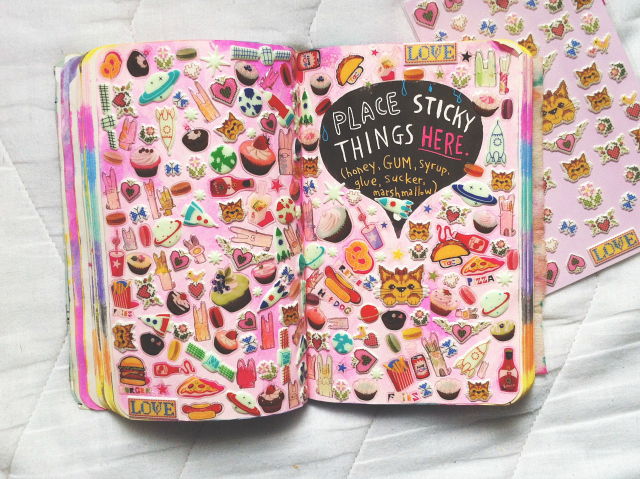 I love your stationary / wreck this journal type posts - inspirational and colourful! What an amazing giveaway, plus I always love seeing your wreck this journal pages - they're always go pretty! 2. Always carry a notepad and a pen with you so that you're ready when inspiration strikes! 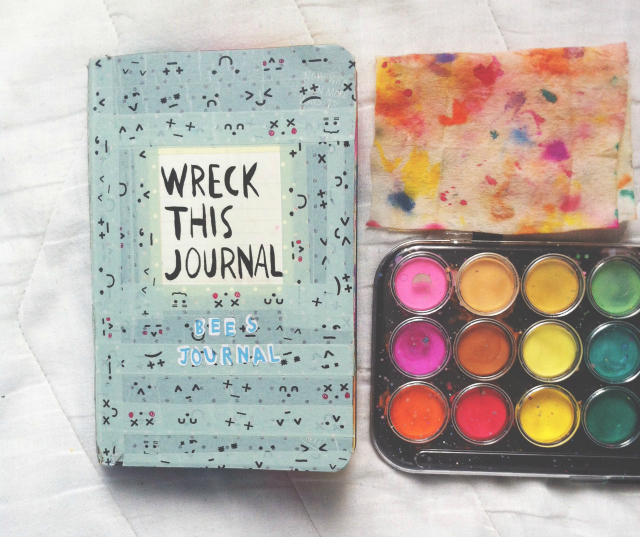 I love your Wreck This Journal posts! I think I'd like to see more 'list' posts because I love the ones you've already put up, and writing-related posts too. The best way I stay creative is to use Pinterest - I literally go through the photography tab and pin anything that I find interesting. I then separate the pins into different boards depending on what they're relavent to. I find this best for when I'm needing inspiration for a certain thing (like a character's eye colour) as there's photos I find inspiring to help. Oh my gosh, yours is probably my most favorite "Wreck This Journal" ever! It's so cute! omg the adventure time page is amazing! I love creative posts from you so I'd definitely like to see more of those! The sticker page is unbelievably cool! Ahhh, I love your Wreck This Journal pages so much! I always love seeing the way you wreck the journal. I especially love the washi tape front and the sticker pages! Oh, awesome giveaway! Your wreck this journal looks great. I get my creative inspiration from pinterest and blogs mainly - I love looking at what people have done and then taking my own spin on it! Creative Advice - For inspiration find copies of artist's sketchbooks, its like seeing inside their mind as they think! This post has definitely inspired me to get creative for once. I'm constantly craving more of these wreck this journal posts, but I enjoy your book related posts just as much! I just recently stumbled across your blog and it was the wreak this journal post that pulled me in. I have one of my own that I have been doing for over a year and I always lose inspiration on it. Your posts have given me some more idea's so hopefully I can do a few more pages! 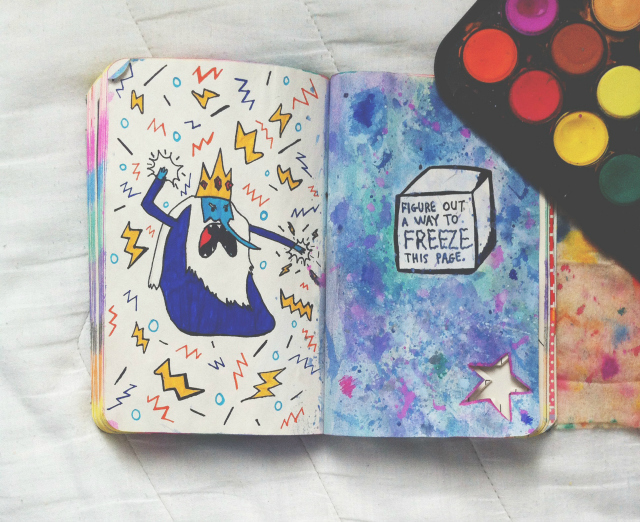 I'm in loooove with that Ice King page! Really, all of these pages are wonderful. So much color. I'm not even sure what I would do on any of these topics, so I'm afraid I can't offer much insight, haha. I've been thinking about buying a Wreck This Journal for quite some time now, and your posts always inspire me to do so. Oh I forgot this. I have no preference of what particular posts I would like to see more of. I particularly enjoy your book posts and stuff about Uni (which was helpful when I started last year!). Ahhh, my first comment somehow disappeared! Anyway, the posts I'd love to see more of are your lists :). As a fellow list lover, I absolutely love reading them and am always left feeling inspired afterwards! Other sources of inspiration for me always include Pinterest, old photographs, and a good cocktail or two! I'd love to see more book posts, as well as creative stationery/diary-type posts! More book posts please, especially ideas for WTJ, as those kind of posts are what inspires me to get creative! I don't think you need to do anything more to be creative - I love your blog posts! Books, books, MORE BOOKS. I freaking love them. I LOVE Keri Smith's books, especially WTJ! They're so quirky and creative, would absolutely adore to win your lovely little giveaway! WTJ is firmly on my wishlist for Christmas, it's such a good idea. Gets ideas from outside-the-box-thinking. I love seeing what you've done to yours! Whenever you post about Wreck This Journal, I'm inspired to pick one up for myself. It's rad that you have made your book so colourful! I would love to see more of your Wreck This Journal posts!